Our technicians are familiar with all kinds of garage door brands and configurations. 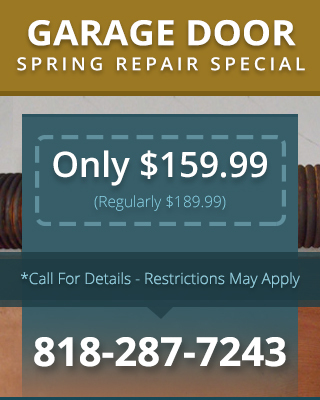 We commonly service Amarr, Wayne Dalton, Unique, Liftmaster, and Genie brand doors and can perform warranty repairs on these brands of garage doors West Hills CA. One especially tricky repair that we can handle for you is garage door spring repair West Hills CA. This type of repair involves unwinding and removing broken springs, which can be dangerous because even a broken spring remains under high tension. We also make sure to tighten the new spring to the correct tension and ensure that the door operates smoothly once the repair is complete.